Day 1 Bangkok/Ban Kao: Early morning departure from Bangkok to Kanchanaburi province. 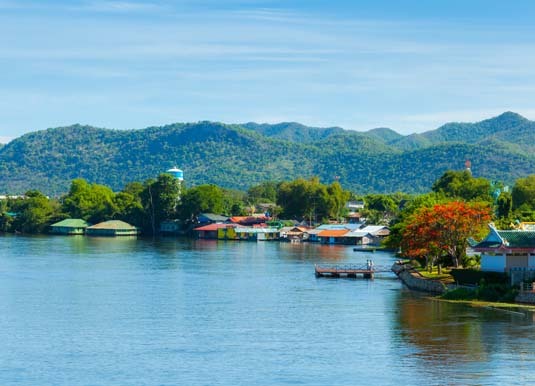 During the journey there is a short stop to visit the Phra Pathorn Chedi, which is the largest pagoda in south east Asia, Khao Noi Cave Temple and Tiger Cave Temple. 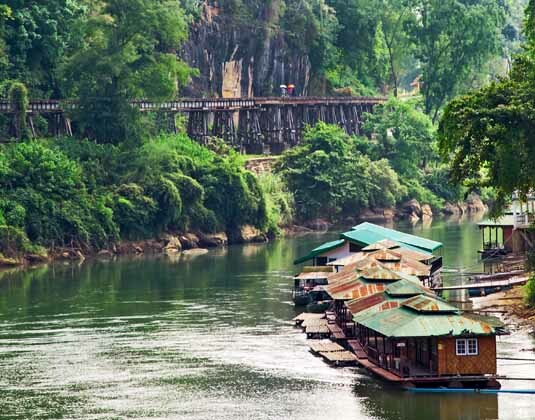 Upon arrival in Kanchanaburi visit JEATH War Museum, a realistic depiction of a prisoner of war camp with bamboo huts providing an inkling of the grim living conditions endured. 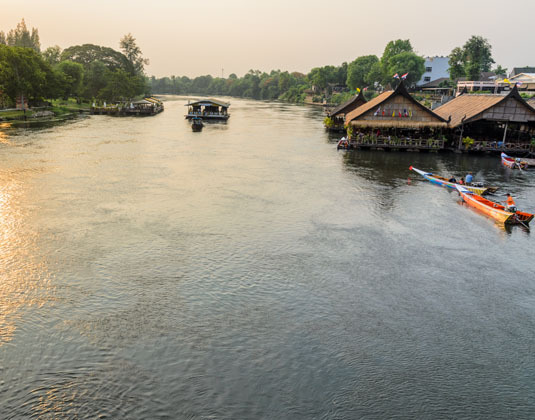 Continue to Wat Tham Khaopoon before boarding the RV River Kwai at Nong Ya where you will enjoy lunch and the afternoon cruising upstream along Kwai Noi River. 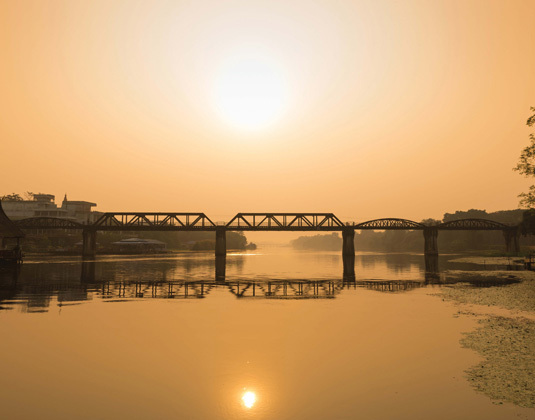 This newly built colonial style river cruiser has been based on designs used by the original Irrawaddy Flotilla which was founded in Burma in 1865. Day 2 Ban Kao/Sai Yok: Disembark this morning to visit Prasat Muang Singh historical park where extensive ruins are a potent reminder of the vast expanse of the Khmer empire. 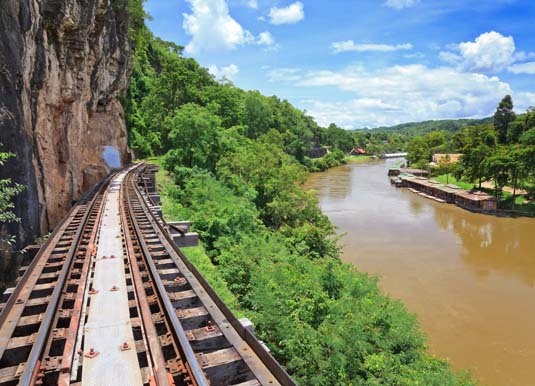 Board a coach which takes you to Tha Kilen where you'll board a train for a short journey to Saphan Tham Krasae passing over the long wooden viaduct. Enjoy the excellent views before continuing by coach for a stop at the Sai Yok Elephant Village. 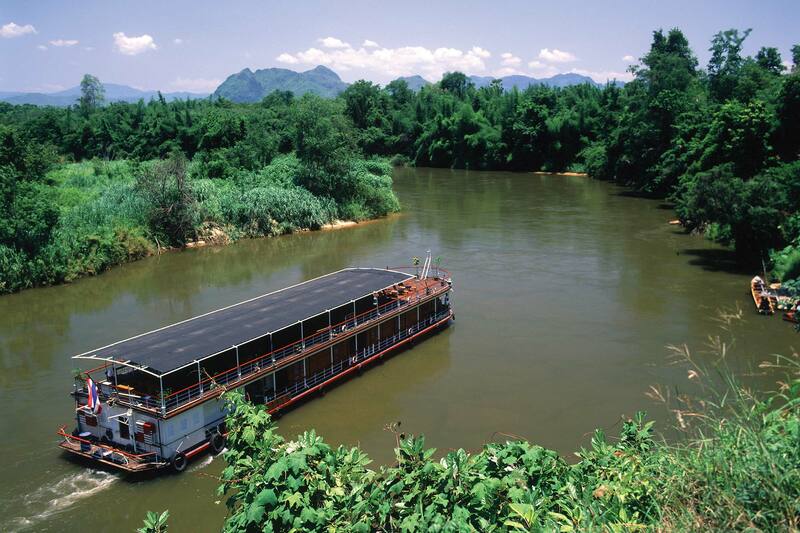 Return to the RV River Kwai for lunch on board and an afternoon at leisure. Day 3 Sai Yok/Ban Hin Dad: Disembark after breakfast and follow the short trail uphill to visit Kaeng Lava Cave, which boasts some spectacular stalactites and stalagmites. 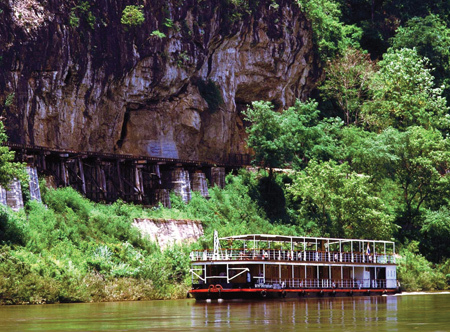 Cruise upriver to Ban Haad Ngiu before travelling by coach to Hellfire Pass, a part of the Death Railway cut through the stone mountain. 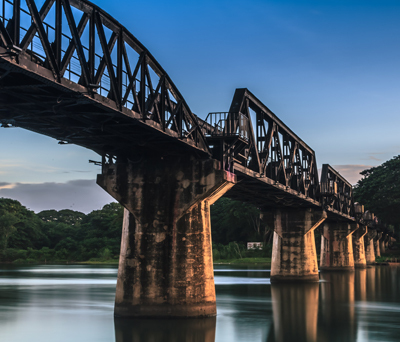 Trails lead to Hin Tok Bridge and Konyu Cutting where a plaque commemorates the ordeal of Australian and British POWs. 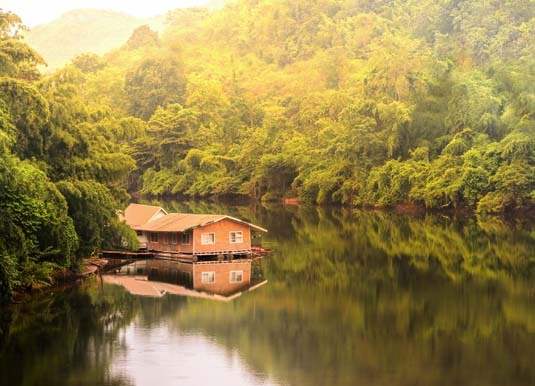 Return to the boat for lunch during which you'll pass Sai Yok Yai Waterfalls. In the afternoon there's a brief stop at a boarding school near the river bank which was built under the patronage of HRH Crown Princess Sirindhorn for refugee children. 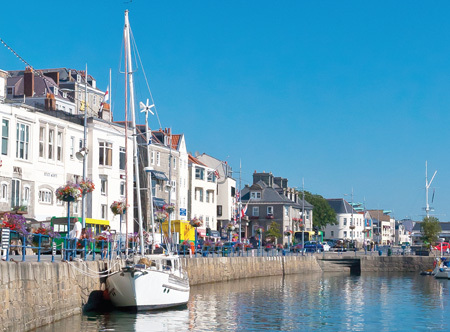 Once back on board there's time to relax before the evening's farewell dinner. Day 4 Ban Hin Dad/Bangkok: Early morning visit to a nearby temple for the opportunity to make an offering of foods to monks. 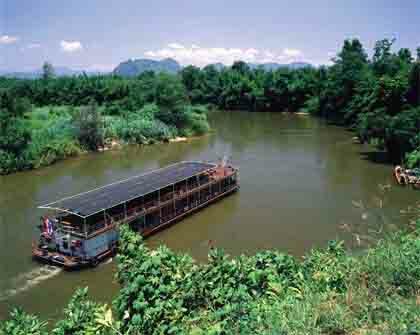 After breakfast on board you'll disembark and return to Kanchanaburi by coach. 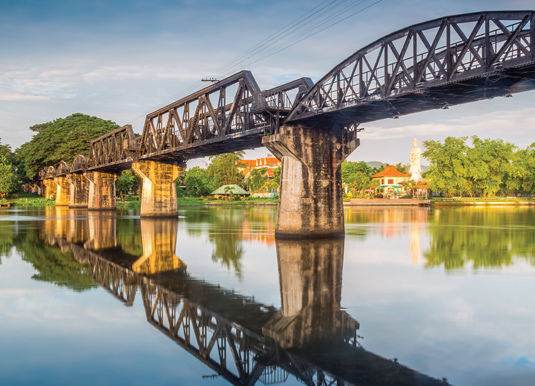 Visit the Thailand-Burma Railway Centre Museum, the Donrak War Cemetery and then the world-famous bridge over the River Kwai. Enjoy lunch next to the bridge before returning to Bangkok. 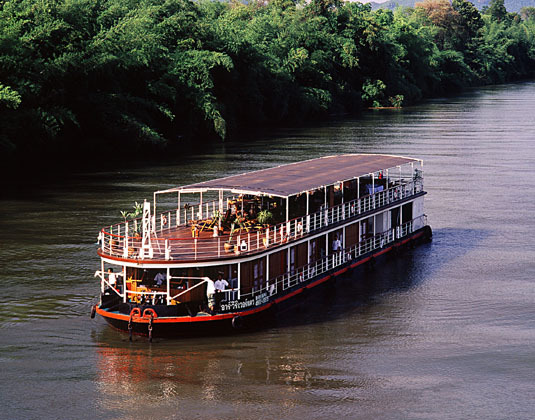 The RV River Kwai is an inland water class vessel 120ft in length with a maximum 8 knots cruising speed. There are 10 teakwood cabins for up to 20 passengers and an upper deck which is open plan with dining, bar and seating areas covered by a collapsible frame awning which enables the vessel to pass under low bridges. 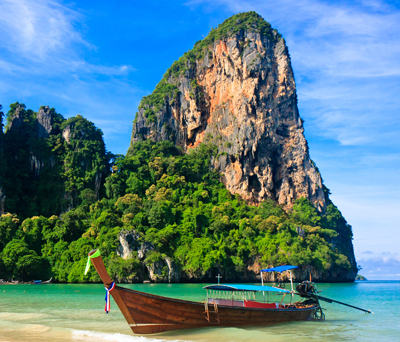 Departures: Guaranteed departures on the 1st and 3rd Monday of the month from Bangkok for the upstream cruise.  Other upstream and also downstream itineraries are available, but only operate with a minimum of four passengers. Meals: Full board on cruise. 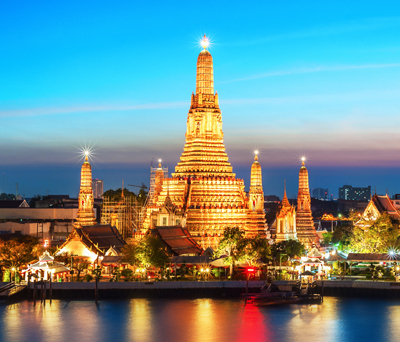 Tour price: The price shown is based on the best value travel dates in low season and includes accommodation in a deluxe twin cabin, full board, sightseeing as outlined, entrance fees and transfers to and from Bangkok.